I’m so glad it’s spring—it buoys my entire person, especially my heart. The warmth of the sun and the greening of the trees and all of nature are glorious, but spring breezes bring me the most delightful sensations and blessings. They help me feel light and strong and sustained and I especially relish those feelings. The heaviness of dark and cold winter days is gone—whew! Every year, I spend as much time outside as possible in spring warmth and breezes—drinking in its new beginnings. And as I go and grow along in life, I continually realize I don’t have forever to luxuriate in spring. Its breezes give me unique gifts I must cherish or not while I am here—alive. No one in all of human history has discovered a way to capture the breeze to keep for later. No one ever will. So, I gotta embrace the light touch of tenderly moving spring air now or never. The same is true for my heart. I can choose to marvel at its unfailing efforts to keep me among the living. It (mostly) silently contracts and relaxes moment after moment, day after day, night after night—circulating blood filled with nutrients, energy, oxygen to nourish my brain, muscles, other organs—all of me. It continually wafts life-giving blood throughout me. So, I feel spring breezes caressing me gently outside and my heart caressing me gently inside with nurturing blood—gifts to acknowledge and appreciate. 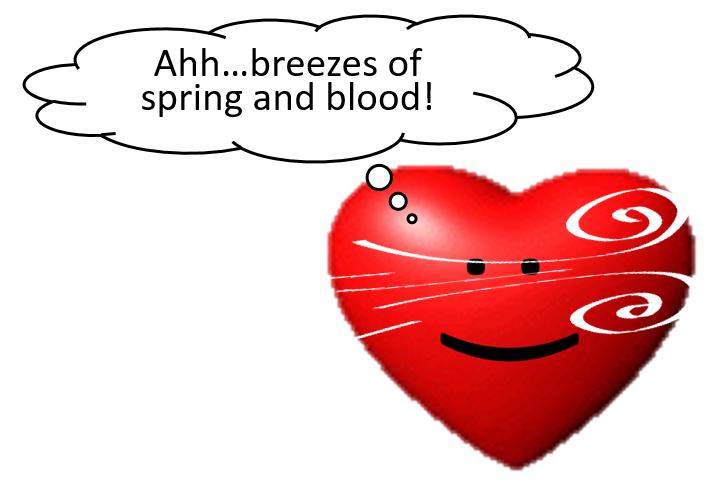 I love spring breezes and my heart! Oh those June breezes thankfully continue in Seattle way past until August. This is the best USA weather ever- I know people want the heavy summer heat but with the marine layer in the morning, and burn off in the afternoon, I am pleased. Sorry to all those that have the heat on! I am here in my family room, with both sliding doors open, enjoying our late afternoon breezes. How wonderful to read of people appreciating that fresh air feeling!